Club Penguin Cheats by Mimo777 Club Penguin Cheats by Mimo777: New Club Penguin December 09 Clothing Catalog Sweet Cheats! 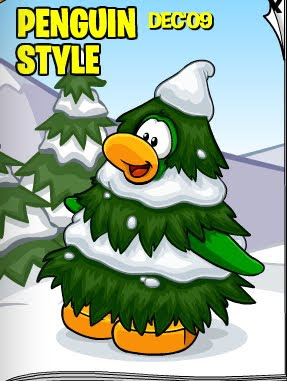 New Club Penguin December 09 Clothing Catalog Sweet Cheats! 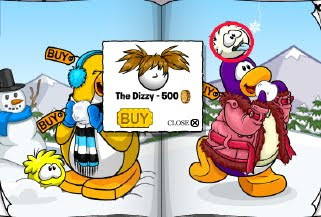 The new December 2009 hidden Club Penguin Cheats in the Penguin Style Clothing Catalog are here. Step 6. Now click on the Coins for Change bucket. You have now found the Stocking Cap cheat! Step 7. Click to the 3rd page. Step 8. Now click on top of the tree in the upper left corner. You have now found the Long Johns cheat! Step 9. Stay on the 3rd page. Step 10. Now click the different instruments in the tree. Step 11. Click on the drumsticks. You have now found the Drumsticks cheat! Step 12. Click on the Trumpet. 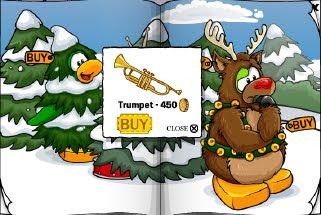 You have now found the Trumpet cheat! Step 13. Click on the Guitar. You have now found the Acoustic Guitar cheat! Step 14. 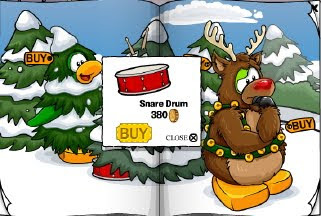 Click on the drum. You have now found the Snare Drum cheat! Step 15. Go to page 4. Step 16. Click on the word "work". 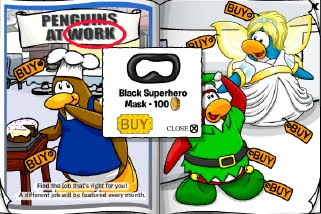 You have now found the Black Superhero Mask cheat! Step 17. Go to page 6 of the catalog. Step 18. Click on the white puffle. You have now found The Dizzy cheat! Step 19. Go to the 7th page. Step 20. Now click on the tiny little Dojo in the back ground. Step 21. Click on and off the Dojo 4 times. Step 22. Click to the 5th page. Step 23. Now click on the small blue mushroom on the right. Now you found the Black Cape cheat! That's all da Cheats! Sweet! Hey guys dont know if uve noticed but der is new xmas iggy music out now!! Mimo, you posted the penguins at work page twice. thats a lot of hidden items! The tree costume makes you more camouflaged than the Ninja Invisibility Costume! Awesome! 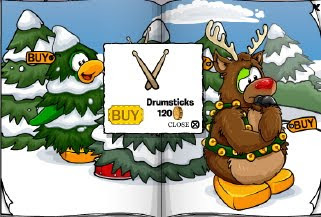 mimo cp messed up they have the snowy tree background in the catalog twice. They did not mess it up. They always leave 2 old ones and 2 new ones. That was a lot of cheats! cool! clubpenguin is finally stepping it up! Hey mimo! 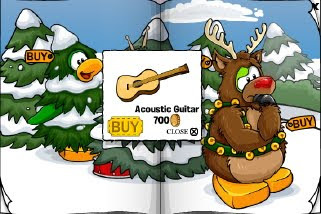 i just found out that they have the same background twice in the catalog! its not very interesting, but i just wanted to point it out! 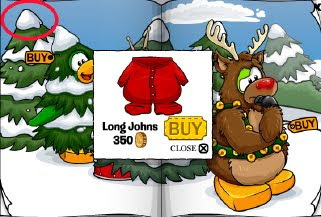 noooooooo i just got the stocking cap and long johns from the treasure book and i am a member. 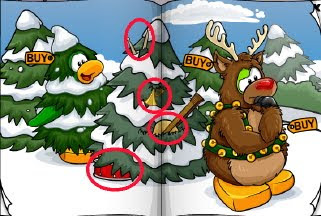 dude also when u wear the tree from the catalog,when you wave it shows some lights. Wow your right. Im sure they will fix it soon. Its ok. That means you will be able to wear those clothes when your membership ends. The hat on the first page is from jonas. Stell wears it. The rest of the stuff is pretty much repeated. Lol, you could go to the Forest, sit facing the trees in the back, you'd be "camoflauged"! I don't have the costume, I'm gonna go try! Your right, too! 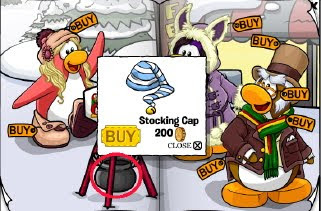 Here's a tip: the next time you get a coin code use it only or most of the items on exclusives because the other items MAY be in future catalogs. the exclusives will NEVER be in catalogs. the only way to get them is to get a coin code. Yeah, Mimo already posted all the snow and sports cheats, but you did a good work on finding it! hey mimo they're now playing the card-jitsu fire video in the dojo courtyard. mimo, i wanted you to hear a cheat i found! if you have on only the christmas tree costume on, and you wave, ornaments/lights will appear on your costume! Mimo,you know when you dance with the tree costume you get light bulbs!